"I understood from her how protection of the environment is key"
[caption id="attachment_8653" align="alignright" width="335"] Clifford Akwana[/caption] Life can be hard in the slums of Kayole in Nairobi. There’s little or no sanitation, no waste collections, and poor access to education. But despite this, children can and do flourish in this environment. One such person is Clifford Akwana who has faced many challenges in his life. 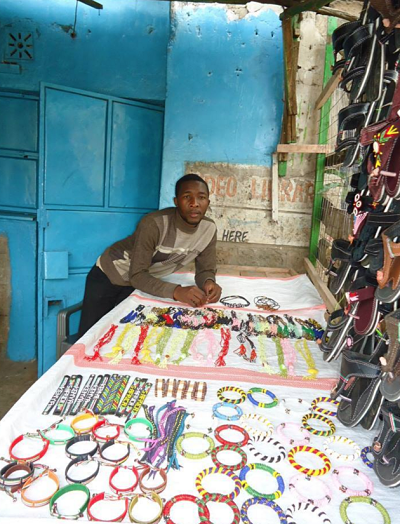 After his father died, he supported his mother as the breadwinner for his family, but still found time to attend informal schools in Kayole, where he learned about the pioneering work of Wangari Maathai, fellow Kenyan and Founder of the Greenbelt Movement. “Wangari was my inspiration. I understood from her how protection of the environment is key to creating healthy and sustainable lifestyles in any community,” says Clifford. And so with very limited resources, but with Wangari’s example close to his heart, he set about transforming his community. Clifford’s main concerns in his hometown are environmental and educational. “I was especially touched by the pollution caused by dumping in the Ngong river in Kayole, where businesses and inhabitants dispose of waste with impunity. There is a ‘Don’t Care’ attitude towards pollution in Nairobi, but I see this as mostly educational. People don’t see the longer-term consequences so they don’t really care. Waste management issues, blocked sewerage systems, polythene and plastics dumping and disposal issues, lack of tree coverage, lack of educational facilities and recreational space for children… these are the main issues that I am trying to alleviate in Kayole.” With a small grant from Artists Project Earth Clifford founded the WOPA Tyre Shoe Project – an innovative scheme designed to create employment for young people in Kayole whilst simultaneously using waste products (tyres) and producing affordable shoes. As well as the tyre shoe project, Clifford works on three other projects: The Green Africa Collection – a jewellery collection made from recycled materials. The project also makes baskets and soccer balls – very popular with young boys in the area – from recycled polythene paper, thereby minimising one of the main environmental pollutants. He also runs a school project in Soweto slum, assisting disadvantaged and destitute children to access education. Through this project, a culture of environmental conservation and advocacy is instilled in the children. Clifford also founded and runs WOPA Kenya which supports young and talented children from Kayole to promote environmental advocacy through the performing arts. Clifford is an ‘unsung hero’ – he beavers away tirelessly for the good of others without expecting any recognition or personal gain. He has dedicated his life to finding ways to live more lightly on this beautiful Earth. Last week, Clifford’s hard work was recognised by the Trustees of Artists Project Earth who announced that he is the winner of their first Earth Citizen Award. “We have been continually impressed with Clifford’s work and dedication to people and planet,” said Kenny Young, Founder and Musical Director of APE. “Clifford is a true Earth Citizen and a wonderful role model for young people in Africa. We are proud to honour him in this way.” As part of the Award, Clifford receives a grant from APE to enable him to further develop his projects.